Washington (AFP) – The latest bid backed by US President Donald Trump to dismantle his predecessor’s health care law likely unraveled Monday when a crucial third Republican formally came out against the plan. Senator Susan Collins, who has waffled for weeks on the latest measure that would overhaul Obamacare, joined Republican colleagues John McCain and Rand Paul as firm no votes on the legislation. Republican leaders had hoped to schedule a vote on the bill, which replaces the Affordable Care Act (ACA) with a system of block grants to states, before a September 30 deadline that would allow them to pass it with a simple majority. “This is simply not the way that we should be approaching an important and complex issue that must be handled thoughtfully and fairly for all Americans,” Senator Susan Collins said in a statement announcing her opposition. The bill would make sweeping changes and cuts to Medicaid, with experts projecting a staggering $1 trillion plus in cuts between 2020 and 2036 to the federal health program for the poor and the disabled which has been expanded under Obamacare. “This would have a devastating impact to a program that has been on the books for 50 years and provides health care to our most vulnerable citizens,” Collins said. Republicans hold 52 seats in the 100-member Senate and can afford just two defectors. Collins’s opposition, along with McCain and Paul, essentially sinks the Republican effort, which had gained steam in the two weeks since senators Lindsey Graham and Bill Cassidy unveiled their new plan. It is sure to be yet another embarrassing blow to the Trump White House, which has yet to secure a major legislative victory more than eight months into his turbulent presidency. Paul criticized as “unseemly” Graham’s and Cassidy’s latest effort to tweak their legislation to sweeten the deal for states like Alaska, Arizona and Maine in order to lure skeptical senators from those states. Paul has attacked the bill as a fake repeal of Obamacare. “It represents Republicans accepting a trillion dollars of Obamacare spending,” Paul said. Some Republicans still had been holding out hope that the measure would get across the finish line. “We’re going to vote on this thing and we’re going to pass it,” Senator Dean Heller, a co-sponsor of the Graham-Cassidy bill, told reporters. But that was before the Collins statement was released. 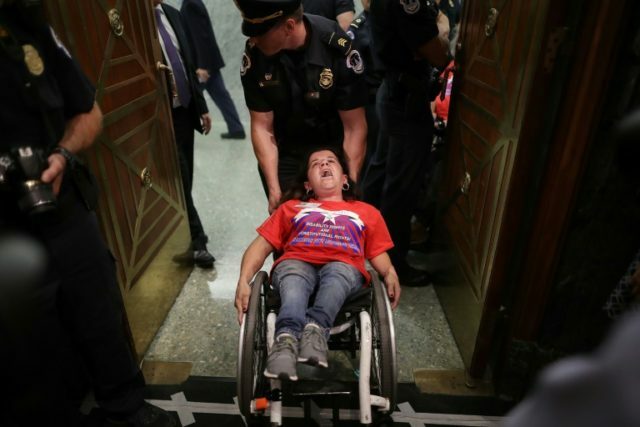 Earlier in the day, tensions over the controversial bill boiled over at the only scheduled Senate hearing on the health measure, when police forcibly removed disabled protesters, pulling some of them from their wheelchairs when they disobeyed orders to leave. “No cuts to Medicaid! Save our liberty!” protesters shouted, forcing the chairman of the Senate Finance Committee, Orrin Hatch, to suspend the hearing shortly after calling it to order. Insurance companies and several health, doctor and patient groups opposed to the plan, tensions burst into the open in what is scheduled as the only public hearing on the contentious bill. Several dozen protesters lined the halls, chanting “Kill the bill, don’t kill us!” At least 50 US Capitol Police were on hand to maintain order, a rare scene in Congress. Graham and Cassidy defended their legislation, which preserves some of the federal funding of Barack Obama’s ACA but converts it to a system of block grants to the 50 US states. “This is not the last chance, this is the best chance” to preserve health care for millions, Graham said. Democrats stand united against the measure. “Health care is a right, not a privilege for those who can afford it,” Senate Democrat Mazie Hirono, who was invited to testify, said as she described being diagnosed earlier this year with stage four kidney cancer.